Gastroesophageal reflux disease (GERD) is a condition where stomach contents flow back (reflux) into the esophagus (food tube) causing troublesome symptoms and/or possible damage to the esophagus. 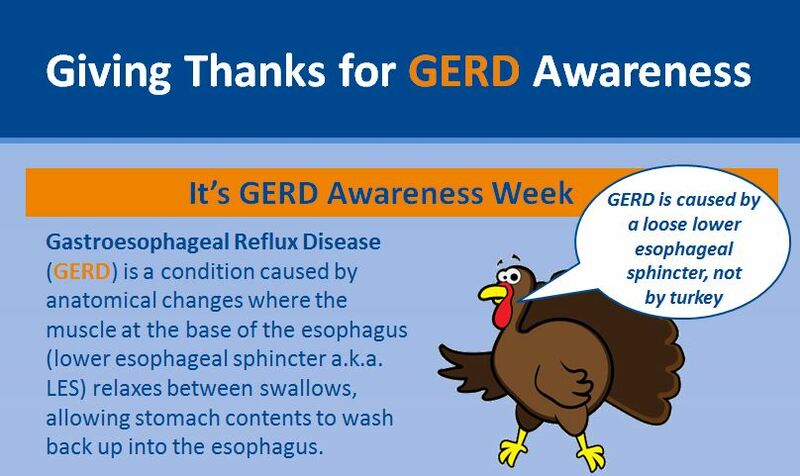 GERD is a chronic disease for which long-term medical therapy is usually effective. The most common symptom of GERD is heartburn. Another typical symptom is reflux of fluid into the mouth. Some of the other less common symptoms may include difficulty or pain when swallowing, sensation of food sticking in the esophagus, hoarseness, throat-clearing, chronic sore throat, wheezing, or chronic cough. GERD can usually be diagnosed based on the signs and symptoms. Tests may be done to confirm or exclude a GERD diagnosis. There is no known single cause of GERD. Reflux occurs when the muscle barrier between the stomach and the esophagus does not work as it should or is somehow overwhelmed. Treatment of GERD is long-term. The goals are to control or reduce symptoms, heal an injured esophagus, and manage or prevent complications. Treatment options include lifestyle changes, medicines, surgery, or a combination of approaches. Lifestyle changes – This means changing things you have control over. Try to identify and avoid things that may bring on symptoms or make them worse. Ask your doctor about diet. Let your doctor know about any medicines you take as some can worsen symptoms. Medicines – Over-the-counter medicines provide only temporary relief of heartburn. Tell your doctor if you need to take one for more than two weeks. The most commonly prescribed medicines to treat GERD are H2 blockers and the more powerful PPIs (proton pump inhibitors). These reduce or limit acid secretion in your stomach. Surgery – For some people, surgery to strengthen the barrier between the stomach and esophagus may be an option. Medicine may still need to be taken after surgery to control symptoms. Before having surgery, review all aspects of the procedure with your primary care doctor or gastroenterologist and the surgeon. Ask your doctor questions about your treatment plan and options. Ask why the treatment is important for you. If you need to take a medicine long-term, at later visits ask your doctor if your effective dosage can be reduced. Ask about risks as well as benefits. Ask about side effects; these can occur with any treatment. Learn what to do if they occur, and how to minimize or avoid them. Learn more about the treatment of GERD. Adapted from IFFGD Publication: Common Questions About Gastroesophageal Reflux Disease (GERD).